The government needs to ‘do different,’ by rethinking the way they partner with social purpose organizations and empowering community-level responses to the challenges that matter to them. Let’s unleash the potential of social innovation and social finance to address Canada’s most intractable social and environmental challenges. What is social innovation and social finance? Many social purpose organizations are committed to finding transformative solutions, but we face barriers in our efforts. That's why the federal Government created a Social Innovation and Social Finance Strategy Co-Creation Steering Group. The Steering Group members – from across sectors and regions – led a nationwide engagement over the past year. Social purpose organizations form a rich ecosystem as important contributors to both the economy and our collective-wellbeing. 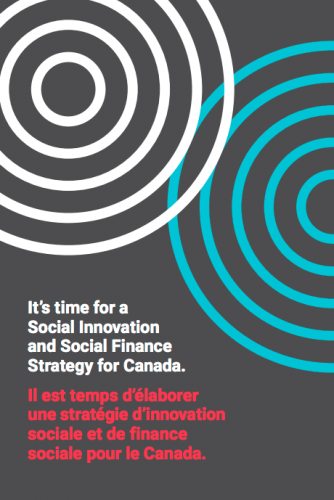 Our goal is to have a Social Innovation and Social Finance Strategy included in the 2019 federal budget, but we need your help! Make your voice heard. Connect with your MP. Inform them of your support for a Strategy. From August 15 to September 16, Imagine Canada is challenging MPs to visit social purpose organizations in their regions. Not able to participate in iMPact Day? There are other ways to get involved! To write an impactful letter, try to personalize it! Include relevant barriers you face, with examples of how social innovation and social finance improve outcomes.